The oldest continually operated market in the state, the Cateret CountyCurb Market opened in 1931. Today, vendors carry on the downtown tradition every Saturday morning during the summer. Listen to live music as you shop for seasonal produce and seafood, fresh flowers, homemade jam, baked goods, plants, and more. Learn more: (252) 222-6352 or crystalcoastnc.org. This Weekend in North Carolina events are pulled from May’s Dates & Events section in Our State magazine. Head downtown and enjoy wine, craft beers, shopping, food, music, and the blooms of the season at this four-day festival celebrating all the flavors of spring. Grab your cowboy boots and join classic country legend Tanya Tucker at the Smoky Mountain Center for the Performing Arts. Kicking off the Friday After 5 concert series downtown, this high-energy group will deliver Top 40 hits and pack the dance floor. Food and drinks will be available for purchase. This two-day festival will kick your carb cravings into overdrive. Start things off at New Belgium Brewery, where you can find everything from freshly milled flour to pastries. Demonstrations and hands-on workshops featuring nationally known bakers will also take place across the city. See ornate figurative sculptures and teapots created by ceramic artist Taylor Robenalt at the Grovewood Gallery’s month-long exhibition of her work. An opening reception will be held on May 5. At this annual downtown festival, shop from more than 100 arts and crafts vendors, see dance presentations, and listen to live music. Kids will enjoy face painting, rock climbing, and inflatables. This live music series at Blackmon Amphitheatre will feature groups like Band of Oz, The Embers, The Fantastic Shakers, and others. Bring your dancing shoes, as well as a blanket or chair to relax in the grass with. Throughout the month, Arts Access will present five talent showcases featuring the work of children and adults with disabilities, including a film, a kids’ exhibit and hands-on arts day, a theater performance, an art show, and a concert. Learn more: (919) 833-9919 or fortunateevents.org. May the Fourth be with you! Be sure to make it out to one of the highest-attended Durham Bulls games of the year. Learn more: (919) 687-6500 or milb.com. VOICES, the Chapel Hill Chorus, will perform English coronation music, British choral gems, and folk songs from Scotland and America at University United Methodist Church. Learn more: (504) 994-5167 or voiceschapelhill.org. This biennial quilt show at the First Baptist Church Ministries Center will feature 200 quilts, a vendor mall, demonstrations, a boutique, door prizes, and a tearoom serving lunch and desserts. Learn more: (704) 431-4998 or salisburyrowanquilters.net. This 38th annual festival is a free-admission event offering a day filled with food, fun, and entertainment, including live music. Learn more: (984) 538-5251 or wakeforestnc.gov. Head to Margaritaville for this tribute performance. The Landsharks are one of the most popular beach music bands in the world, and have opened for and performed with Jimmy Buffett. This monthly spoken words event at the Fayetteville Arts Center features poets from North Carolina and around the U.S. Learn more: (910) 745-7219 or welcome2ourplace.org. Created specifically for children and their families, this event will be held at the Piedmont Centre. Registration is required. Learn more: (336) 508-4380 or runsignup.com/gofar. Purchase pollinator plants and plants native to North Carolina, and attend educational gardening demonstrations on container planting, pollinators, invasives, soil samples, sun and shade plants, and more. Learn more: (919) 245-2050 or hillsboroughgardenclubnc.com. Spend an afternoon at RayLen Vineyard and Winery, where there will be live music, food trucks, and more than 50 local vendors. This eighth annual festival on downtown’s Fayetteville Street celebrates inclusivity and will feature family-friendly live entertainment, local vendors and artists, food, a kids’ zone, and a beer garden. Learn more: (919) 832-4484 or outraleigh.org. In this unique concert at Keppel Auditorium, acclaimed country music artist Darrell Harwood will join the Salisbury Symphony. Learn more: (704) 216-1513 or salisburysymphony.org. This annual festival on Main Street combines food trucks and live music with vendors selling garden decor, plants, crafts, outdoor furniture, antiques, and more. Learn more: (336) 475-4219 or visitthomasvillenc.com. This festival will feature workshops with talented instructors Don Pedi, Carol Walker, Tull Glazener, Judy House, and Carol Crocker, followed by a concert. Learn more: (919) 302-4400 or winstonsalemdulcimerfestival.com. 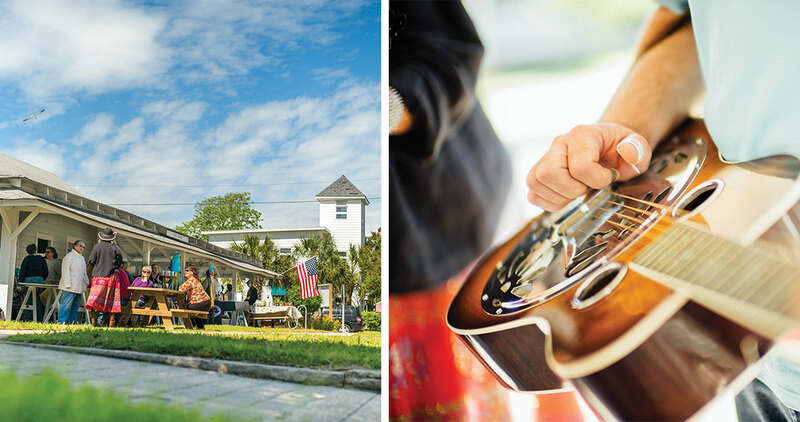 At this weekly market, more than 65 vendors gather on the Cape Fear riverfront to sell fresh produce; baked goods; and handcrafted decor, gifts, and jewelry. Live music will entertain shoppers. Learn more: (910) 988-7106 or downtownsouthport.org. Enjoy a spring performance by the Craven Community Chorus at Orringer Auditorium; the major work will be Schubert’s Mass in G.
Rissi Palmer has described her style as Southern soul, and has performed at the White House and at the Grand Ole Opry. Now, she’ll sing at the Red Rooster during this free community concert presented by the Pamlico Musical Society. Enjoy the Best of the Best BBQ Tasting and Sauce Boss Competition; live music; a kids’ zone; amusement rides; shopping; wine, beer, and barbecue; and more at this 37th annual festival. Eight galleries in the area — Franklin Square Gallery, Art @ 211, The Ricky Evans Gallery, Lantana’s Gallery, Anastasio’s Glass Studio, Darrel Edwards Gallery, Howe Outrageous Art Gallery, and Silver Coast Winery & Gallery — team up to offer art, appetizers, and wine to visitors, all free of charge. Learn more: (910) 457-5450 or townofsouthportnc.com.